Graduation is usually a time of celebration, when young people complete their high school studies and move on to work or college. For parents of students on IEPs, graduation has an additional significance because it ends their child’s right to special education. Once a student accepts a high school diploma, special education services end. This makes planning for the transition to adult life especially important. Transition planning needs to happen first, followed by transition services, and only then by graduation. The goal is not to graduate on a schedule, but for the student to acquire the skills necessary to function independently in adult life and to become a productive member of society. All too often parents do not adequately plan for their child’s transition to a post-high school life. If schools do not bring up this topic at Team meetings or do not make parents aware of its importance, parents may be unaware of how critical it is. Without appropriate planning, students with disabilities can graduate from high school without being prepared for post-secondary education or employment. The U.S. Government Accountability Office reports that the employment rate for young adults with disabilities is less than half the rate of their peers without disabilities. The federal law IDEA requires transition planning for students on IEPs beginning with the IEP in effect when a student turns 16. A better time to begin planning is with the IEP that will be in effect when a student turns 14. 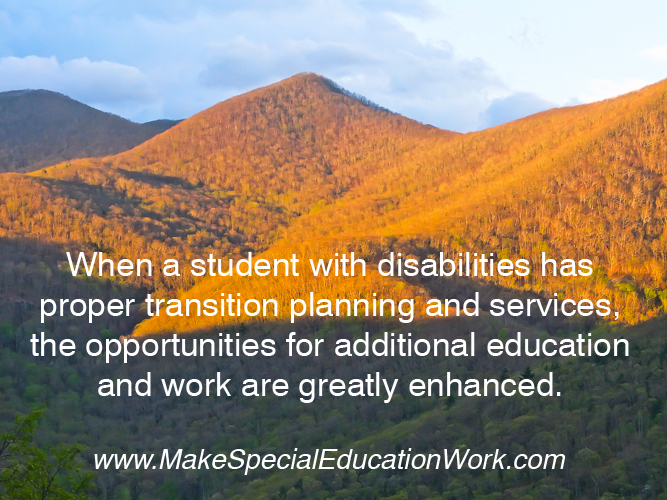 In fact, many state special education laws require transition planning and services to begin at this earlier date. A transition plan should outline a course of study and specify what services are needed to support a successful transition. This includes identifying any state agencies outside the school district that might be responsible for helping with the transition process. Parents can help their child think ahead beyond high school graduation. For example, does the student want to attend college, vocational school, work at a job, or live independently? Will the student need various services to become independent, such as travel training, remediation in reading, writing, and math skills, counseling, or occupational therapy? Teams also need to consider health care, transportation, and community experiences. Transition planning can be complex depending on a young person’s needs. It is not as simple as achieving passing grades and passing state mandated exams, as recent hearing decisions in Massachusetts have demonstrated. Since accepting a high school diploma means an end to special education services, there is a significant financial benefit for schools to graduate students on IEPs and end their obligation to provide special education services. Otherwise, the federal law IDEA allows for special education services to continue until a student’s 22nd birthday. This provides an incentive for schools to devise different and creative ways to move a struggling student along the path to graduation, and for parents to carefully monitor whether their child has made sufficient progress in meeting transition goals. Since most states allow school districts to set their own graduation requirements, we have observed that some districts play a graduation game by adopting low graduation standards to move students out of the system. Districts can legally reduce the number of required credits to graduate, lower performance criteria, or substitute a different course for a student who might have difficulty passing a required one. Our school district actually tried to force our son to graduate before he had earned enough credits to apply to college. Since attending college was his primary transition goal, we filed for a hearing to prevent them from issuing a premature diploma. The lesson is that low graduation standards can be used as a tool to remove a student from a district’s special education obligations by forcing a student to graduate before he or she is ready. In addition to a regular high school diploma, schools can offer students different kinds of exit documents that require a less rigorous curriculum. These include alternative diplomas, which go by names such as an IEP diploma or vocational diploma. Some schools offer certificates of completion or certificates of attendance. None of these documents end special education or transition services. The only document that will do that is a regular high school diploma. These alternative exit documents can be an appropriate solution for some students, but parents should be aware that they can flag the graduate as a special education student and may limit that student’s options for the future. Begin transition discussions with your child’s Team by the time your child enters his or her freshman year in high school, usually by age 14. Start looking at post high school options, such as vocational training, internships, or further education, and have the Team write a transition plan into your child’s IEP. Be sure to update the plan yearly. If your Team doesn’t feel that your child can meet the course standards for a regular high school diploma, ask the following: 1.) What accommodations and services are in the IEP that would help your child meet the same requirements as other students receiving a standard diploma? 2.) Would staying in school until he or she reaches the maximum age of eligibility in your state allow your child to earn a standard diploma? and, 3.) Would any form of alternative diploma or certificate be appropriate for your child’s level of performance and would earning it give your child the skills to lead an independent life?